The turkey’s been stuffed. The first snow has hit the pavement. Ambitious merry folk in white-trimmed red-felt hats are already weighing down conifers in their living rooms with glass globes and tinsel. Yes, ’tis the season when one naturally begins to wonder, “Hey, where do all the bees go in winter?” Good question! After all, this is the time of year when we worry about the homeless and the hungry, so shouldn’t we take a moment together to worry about the bees too? It’s only right. And turns out it’s pretty interesting too. Keeping with the spirit of the holiday season, I would love to tell you that the bees are hibernating, tucked away in the furry warmth of some backwoods cave, slumbering gently until spring when they will flutter their wings once more. I would also love to describe to you how they are being peaceably tended in these starlit caves by amicable shepherds and angels, but then you would know I was lying. What, in good faith, I have to tell you is this: The bees are dead. (Call the press! No…don’t.) The adult native (non-honey) bees of summers gone are dead. But their squishy larvae babies are currently noshing on bee bread, cycling through instars, spinning cocoons, and stretching out tiny veins through new delicate webs of wing (all without the aid of shepherds or angels). They are busy with all these activities right under your nose, hunkered down in underground cells meticulously crafted from mud, leaves, petals, wax. Ensconced in a chamber of secrets, solitary bees are nowhere and everywhere in winter, absent from their usual aerial haunts, but tunneled into every bare ground patch, hollowed shrubby stem, and vacant wooden cavity around you. They could even be nesting in the walls of your house. (Call the exterminator! No…don’t.) So while we can’t accurately imagine most bees as iconically hibernating like Yogi or Smokey or anyone else, what the bees are up to these days is at least as endearing, intriguing, and worthy of cartoon caricature and idolatry. Animals have a variety of strategies for surviving the winter, collectively termed ‘overwintering.’ Many birds, some large mammals, certain charismatic insects, and many of our very own geriatrics migrate long distances to avoid having to fatten up and hunker down through the cold months. 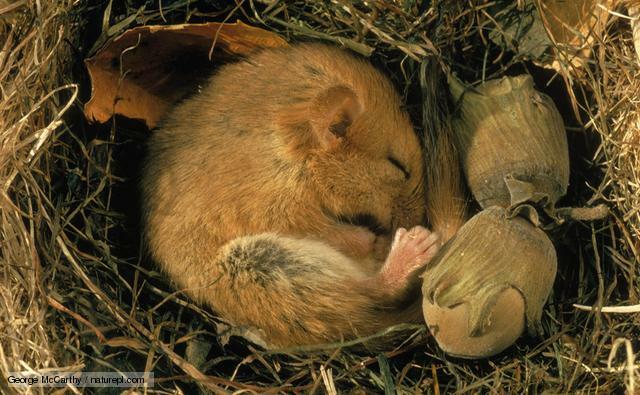 Other adorable creatures embrace hibernation, spending autumn preparing their hibernacula (‘tent for winter quarters’ in Latin) in which to cuddle up and sleep the winter away, assuming an impressively boring state of torpor and suppressed metabolism for months on end. As mentioned above, most adult native bees do not survive the winter and so are not concerned with hibernacula feng shui, but of course there are exceptions. Queen bumblebees are born at the end of the summer and are the only ones from their hive to survive the winter. After embarking on a late summer mating flight in the early weeks of their lives, they load up on as much nectar as their little honey stomachs can hold, locate a north-facing slope in a good neighborhood with soil that holds just the right amount of moisture, and excavate their very own hibernacula. Here the once and future queens will exhibit a level of patience achieved by no other queen in history, suspending all activity until warming soil temperatures in the spring spell promises of abundant floral bloom awaiting them at the surface. But before this thawed blessing arrives, the queens, like all those on the brink of greatness, must perform a heroic feat of mad science. To prevent damage to their internal tissues from crystallization in extreme low temperatures, they transform their own blood chemistry by producing and inoculating themselves with the anti-freeze agent glycerol. This impressive display of self-mastery allows them to pass the winter unfazed by the elements, emerging into the spring with all the youthful vigor they possessed last fall. Select few superhumans have been documented as having the strange ability to manufacture ethanol from carbohydrates in their own guts, a blessing or a curse termed auto-brewery syndrome. Try as I might to alter my own blood chemistry every winter, I have not yet been able to endure extreme cold with the same impunity and composure as these bumblebee queens. 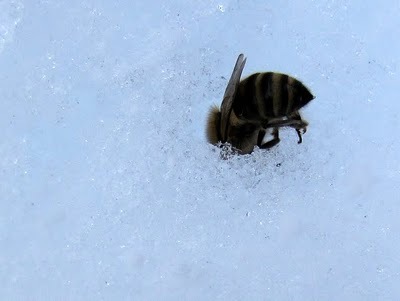 Speaking of self-mastery, honeybees go all winter without taking a poop. Next time someone tells you they think insects are gross, you can throw that little nugget at them. Honeybees pass the winter inside their hives, huddled together for warmth, unable to leave the hive due to snow cover and dangerous temperatures, and refusing to defecate inside the hive lest they foul the common living space. Instead, their rectums become distended with feces during the coldest parts of the winter. Beekeeper Sue Hubbel reports in A book of bees that “on a winter day warm enough for [the bees] to fly out, the snow in front of their hives is spattered with yellow droppings which have been retained inside their bodies. If they do not have a flight day every few weeks, they will sicken rather than eliminate their metabolic wastes within their hive.” They also use warmer days during winter to remove their deceased sisters from the hive. Although adult honeybees will live longer lives during the winter than their overworked summer siblings, individual adult honeybees cannot expect to experience both a summer and a winter, though the hive as a whole is active year-round. Bees that attain adulthood in the hive during the fall typically have access to more pollen than those reared in the spring when stores are low and activity high. Because of the additional fat and protein bestowed upon them during development and early adulthood, and because they avoid the foraging sweatshop their spring sisters are born into, these autumn bees generally live long enough to help the queen start her spring brood at the end of a long winter of punctuated dormancy. Unlike the fasting, motionless animals tucked away in hibernacula, the honeybee hive will survive the winter by consuming its honey stores and exercising flight muscles to generate heat inside the hive. Stocking the pantry with these winter preserves is, after all, what they work so hard collecting nectar for all summer. If you open a honeybee hive during the winter, which is apparently not advised if you want your honeybees to survive, you will observe them progressively clustered together in different areas of the comb as they pace their way through consumption of their winter stores. This overwintering behavior has, of course, been bred into honeybees to some extent. There are varieties of tropical honeybees who tend to migrate away from food and water shortages instead of enduring this long winter frugality. 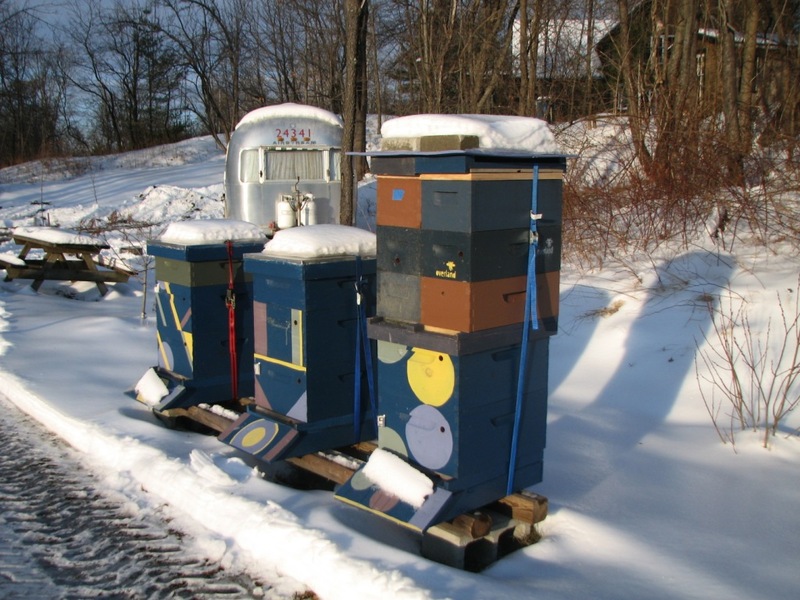 But the honeybee strains we know and love have largely been selected by agriculture to stick around for the winter in the hives we provide, so we can orchestrate their migration ourselves to the crops we need pollinated in the spring. This is not a good overwintering strategy. Neither stowed away in hibernation like the bumblebee queen, nor subsisting at a semi-dormant state like the honeybee hive, solitary bees are engaged in an entirely different game throughout the hostile winter months. They are using their winter chambers as wombs, progressing from egg to larva to pupa to adult in silent isolation while they wait out the photosynthetic drought. As we’ve discussed before, diversity among native bees is immense, and likewise the nesting strategies of these furtive pollinators is expansive. Above ground, bees make use of pithy stems, decaying wood, tree cavities, and old beetle burrows to lay the foundations of their winter homes. 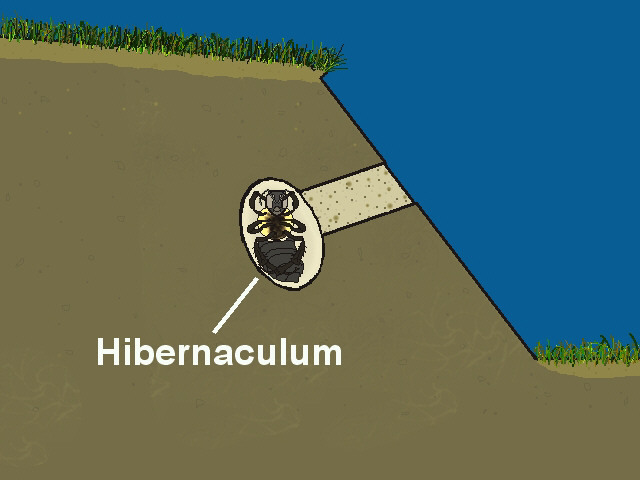 The term ‘ground-nesting bees’ describes a wide range of digging habits of bees who employ their mandibles, claws, and the pygidial plates found at the ends of some species’ abdomens to burrow into sand, soil, gravel, and mud at various aspects and slope angles to depths of a few centimeters to a few meters. Before going about collecting pollen for their young, bees make use of their corbicula (‘pollen baskets’ made of special hairs on their hind legs) to transport resin and other nest building materials. Some bees use tibial spines and basitibial plates to give them traction along the internal walls of their burrows while they push out dirt or rotten wood from the excavated hole. Ain’t that the bees’ knees?! (Literally, it is.) Lacking proper mini jackhammers, bees may activate their flight muscles to send vibrations through their mandibles to loosen and remove rocks in the tunnel path. Often times bees use their glossa (long mouthparts) and penicillus (a brush-like structure on their hind legs) to coat burrow walls with liquid wax and antimicrobial secretions to ensure the correct humidity and infection-free environment for their babies through the long winter. 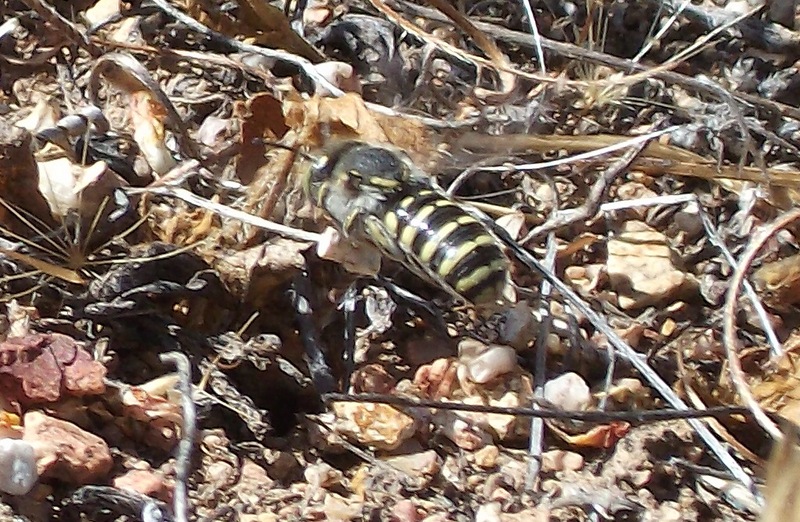 During a summer at Pinnacles National Park in California, I watched a ‘wool carder’ Anthidiine bee push tiny rocks out of her burrow and carry them between her front legs to discard on the adjacent hillside (perhaps to avoid giving away the nest location with an obvious tumulus, or nest debris pile). I flagged the nest and returned several weeks later to find her at the concluding end of this process. Carefully retrieving select pebbles from where she had deposited them only weeks before, she made methodical counterclockwise flights from the hillside to her nest where she rolled the toted pebbles into the burrow opening to shelter and conceal her offspring below. A week after that, I made a final visit with a yard butler gardening tool and fine forceps to retrieve the mysteries she had left behind. Deep into the hardened ground, I slowly unearthed several balls of insulating fuzz (‘wool’ made from gathered plant fibers), each enclosing a hardened capsule with a developing bee larva inside: a winter coat and a mother’s final wishful oblation. I kept the unopened capsules in a fridge during the winter and on my desk that following spring in hopes that they might continue their development and validate their mother’s labors. Unfortunately, the fluffy spoils of my dig remained lifeless, but there are millions more Anthidiine larvae nestled into the their home-made wool coats who remain safe from my yard butler. Anthidiine bee carrying a pebble back to her nest to help close and conceal the entrance hole. Photo J. Meiners. Undoing the bee’s hard work, pebble by carefully selected pebble. Photo J. Meiners. 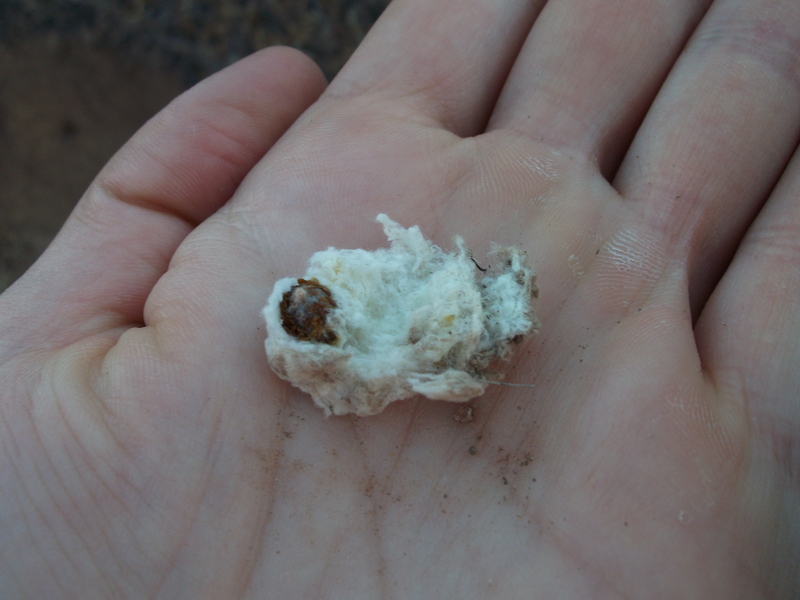 Inside the nest there were a series of these hardened egg capsules, each enclosed in a sheath of ‘wool’ fibers laboriously scraped from plant leaves. Photo J. Meiners. Open the capsules and see all the larvae! Photo J. Meiners. 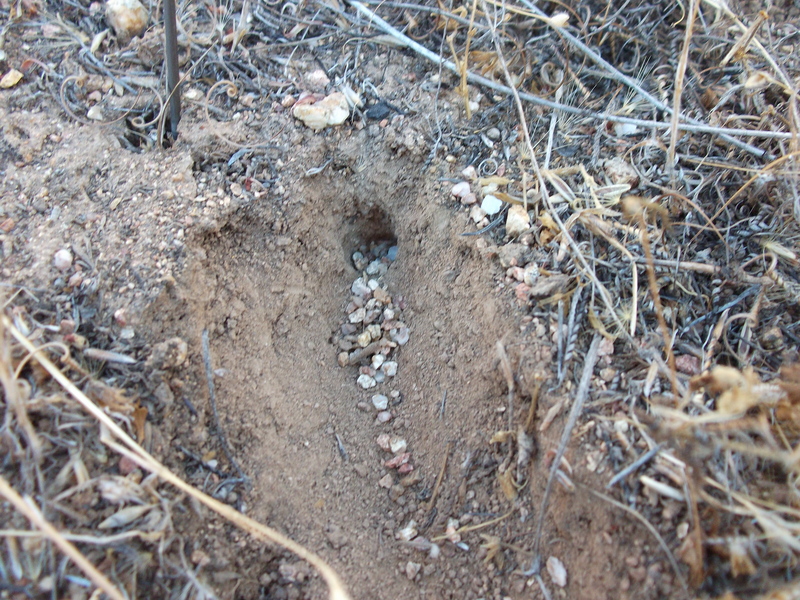 Once burrow excavation is completed, there are many ways adult female native bees go about constructing the finer points of their external winter womb. Megachilid, ‘leaf-cutter’ bees, collect tiny leaf pieces, precisely excised with their hardy mandibles, and cement them together with oral secretions to create cryogenic capsules suited for nursing their young through the winter. 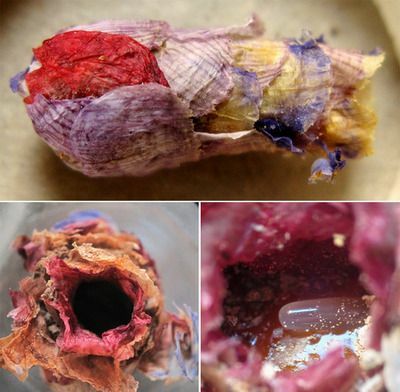 Bee nest biology expert Jerry Rozen led a team of melittologists in 2009 on a trip to Turkey where they discovered the gorgeous, immaculately crafted nesting cells of Megachilid Osmia avosetta, built entirely from petals (see pictures below!). On a less endearing note, it has been speculated that some tropical Trigona spp. construct their nest cells out of carrion and feces. Usually these capsules hold a single oblong, opaque egg, delicately laid on top of the pollen/nectar provisions just before that capsule is sealed and construction of the next one vertically up the burrow begins. In the case of most Bombus spp. (bumblebees) and Megachilids like Megachile policaris and Lithurge fiscipennis, however, large cells are built to hold several young which grow through the winter together. Perdita spp. make unlined cavities in the sand for their offspring, while Xylocopa spp. drill their burrows into wood and masticate wood pulp to create masterfully carpentered cell divisions between individual egg chambers. Anthophorini bees close their nest cells with spirally constructed mud and a small hole in the center. When you look out your windows this winter at the blanket of white snow that appears to have superseded all signs of life and color, remember these bright and intricate capsules, buried beneath it all, incubating the bees of spring. Nest cell (and an egg) of Osmia avosetta, made entirely from petal pieces. Has your mother ever constructed something so beautiful for you? Photo J. G. Rozen. Stem-nesting native bee overwintering strategy. So while our favorite cuddly mammals are curled up in their hibernacula doing exactly nothing all winter, and we are bemoaning having to scrape our windshields each morning, native bees are busy reinventing themselves in elaborate underground caverns. The bee activity we witness during the summer months is only a small fraction of the work it takes to be a bee. 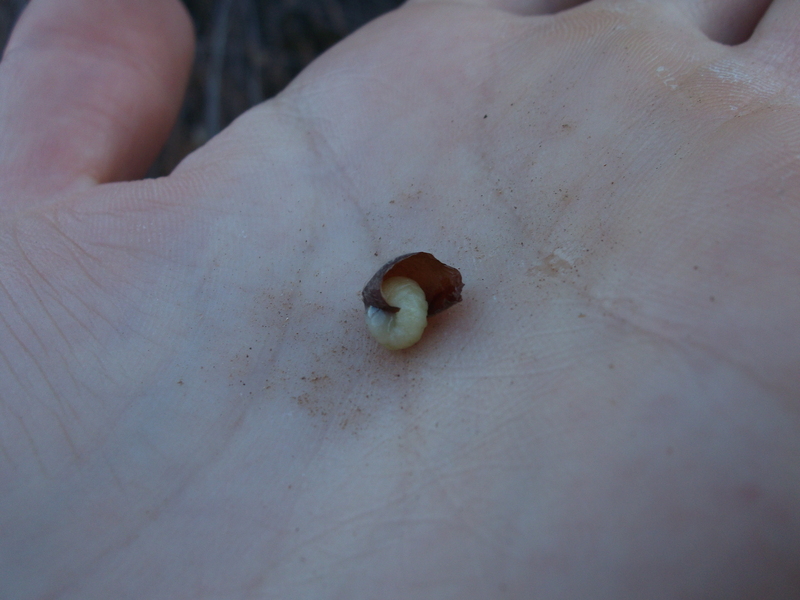 Morphing from a tiny, curved egg, through five instar stages as a larva, including spinning a cocoon inside the nest cell for many species of Apinae and Rophitinae, and then slowly adopting the articulated form of a prepupa or unpigmented adult is a lot to get done in a few short months. And this is to say nothing of the plight of cuckoo bee eggs, laid by their parasitic mothers in the nest cell of another unsuspecting bee, who must hatch before their host egg, steal its food, fight it to the death with only its meager piercing mouthparts, and then grow into stealthy adulthood next to the sticky remains and neighboring sibling cells of its victim. (Check out this paper for some images of a cleptoparasitic Stelis ater bee larva attacking its host Osmia chalybea larva and stealing its nest provisions.) These truly impressive life transformations and micro bee warfare are all going on underneath your serene snowshoe hike. And as we know, once the bees make it to spring, the struggle only picks up from there. Let’s briefly review the accomplishments of the average native bee, and take a quick look at our own: From the moment of initial emergence from their natal home to the time when their wings have literally shred to pieces from overwork about four weeks later, native bees achieve more than many of us mere humans will in decades. Upon reaching sexual maturity, solitary bees leave the home their parents built for them and never return. (USA today reports that, as of 2012, 43% of 20-24 year old Americans live with their parents, 19% of those between 25-29, and 9% of those 30 -34.) Ground-nesting adult female bees will spend their first weeks of life searching out a suitable nest site and excavating their own new home by hand (er, claw), laboriously scraping out a cavity in the ground with their mandibles, carrying out the debris pebble by pebble, packing down the walls with their pygidial plates, and cementing the foundation with homemade waterproofing and antimicrobial secretions. Many bees will then furnish the burrows with artfully crafted leaf, petal, or wax capsules to cradle their young. (A 2012 Gallup Poll reports that only 62% of Americans own their own homes. No statistic on how many build their own homes.) Bee mothers will collect and provide all the food their children will need for their entire immature development and package it all neatly for them before the winter sets in. (Baylor College of Medicine reports that in 2013, only 38% of American children bring a lunch packed by their parents to school.) The mother will then gracefully depart the scene, and the young bees will take control of their own development, pushing through infancy, adolescence, and into maturity with solitary resolve (Do we need a statistic for this one?). Winter for bees is hardly a long peaceful nap in cushy hibernacula, nor is it a seasonal trip to the beach with their flock. Though you can’t see them and their buzz is missing from the cold December air, bees are up to something incredible this winter. Inside wool coats and petal casings, with altered blood chemistry and full rectums, they are pacing themselves through the frosty nights, building their strength and molding their bodies into forms equipped to facilitate the fantastic wildflower shows we will be expecting come spring. What are you doing this winter? This is my overwintering strategy. Photo R. Choi. 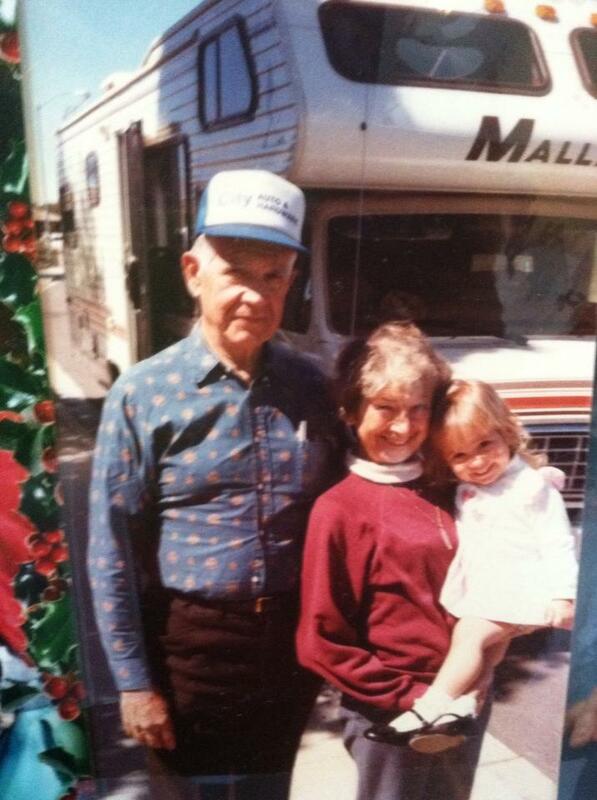 Henry, Marilyn, and Joan (me) Meiners, back when everything seemed possible. Baumgartner, D.L. and Roubik, D.W. 1989. Ecology of Necrophilous and Filth-Gathering Stingless Bees (Apidae: Meliponinae) of Peru. Journal of the Kansas Entomological Society, Vol. 62, No. 1, pp. 11-22. Hubbell, Sue. A Book of Bees: –and How to Keep Them. New York: Random House, 1988. Print. Michener, Charles D. The Bees of the World. Baltimore: Johns Hopkins UP, 2007. Print. Michener, Charles D. The Social Behavior of the Bees. A Comparative Study. Massachusetts: The Belknap Press, 1974. Print. Potts, Simon G. et al. 2005. Role of nesting resources in organizing diverse bee communities in a Mediterranean landscape. Ecological Entomology. 30, 78-85. Rozen. J.G. et al. 2010. Nests, Petal Usage, Floral Preferences, and Immatures of Osmia (Ozbekosmia) avosetta (Megachilidae: Megachilinae: Osmiini), Including Biological Comparisons with Other Osmiine Bees. American Museum Novitates. Number 3680, 22 pp., 44 figures, 1 table. 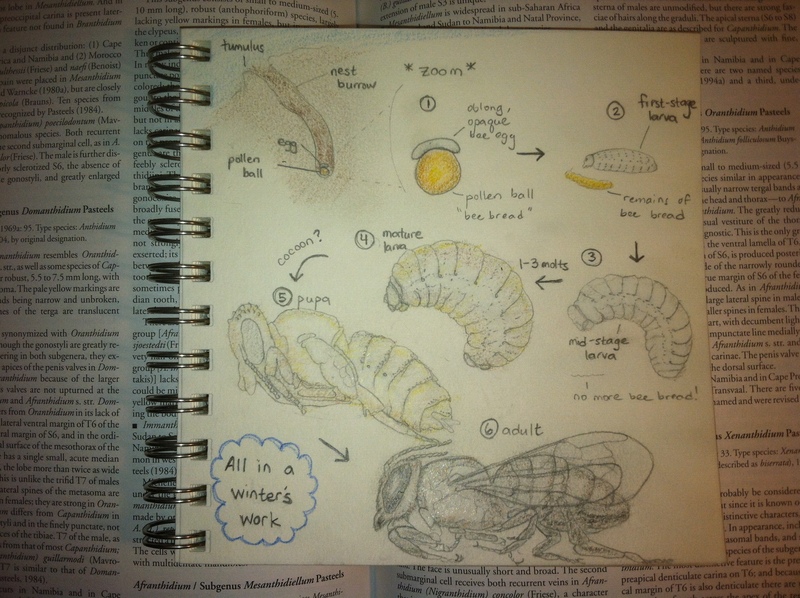 This entry was posted in Bees, Behavior, Native bees, Nesting. Bookmark the permalink. 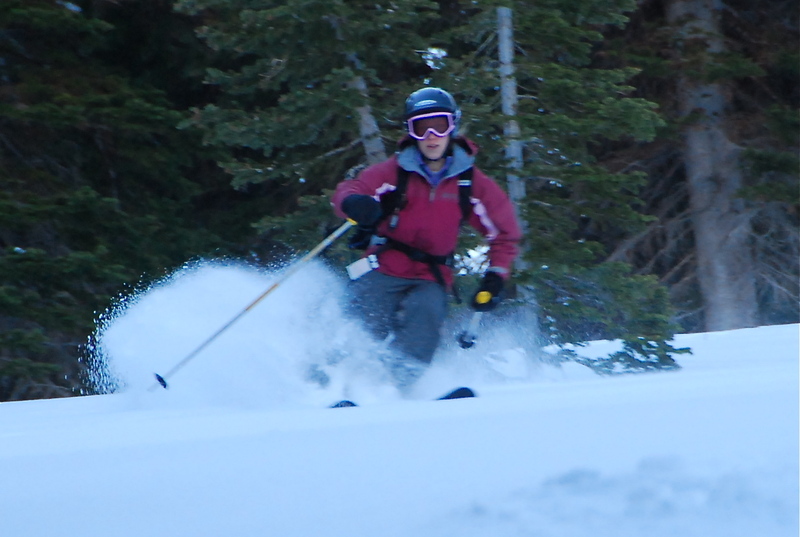 You should work this post into a Wild About Utah for UPR. I was surprised to learn that bees choose north-facing slopes for hibernation, like amphibians but unlike reptiles. Moisture must be pretty important to them if they forego warmer hibernacula from which they could emerge earlier. PS I love the etymology of hibernaculum, which I did not know, and the Anthidiine bee photos are amazing. That’s interesting about amphibians and reptiles! I’m not sure if all bees use north-facing slopes, I’ll have to look into that for you. In the bumble bee queen’s case, I’m guessing it has more to do with calibrating the timing of spring soil warming to coincide with bloom than with increasing soil moisture, since many bees go to a lot of trouble to waterproof their nests and lock moisture out. This delicate bloom-bee emergence balance is one of the things we are watching most closely as global warming advances the initiation of spring! That makes sense about the decoupling of trophic and plant-pollinator relationships – amphibians & reptiles don’t enter into those kinds of partnerships to the extent that bees do. I imagine it varies with latitude as well. In the southeast some snake can be active in warm days in winter, like the black ratsnake I found on Sunday.